Laminated tape features standard adhesive designed for flat surfaces such as office paper, file folders and binders. Tape resists water, grease and grime. Use in hot and cold environments as well as outdoors. 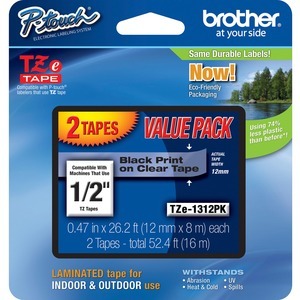 Water-resistant tape is designed for use with Brother using TZ or TZe tapes. They include PT-D200, PT-D210, PT-H100, PT-1010, PT-1090, PT-1230PC, PT-1280, PT-1290, PT-1830, PT-1880, PT-2100, PT-2110, PT-2030, PT-2030AD, PT-2030VP, PT-D400, PT-D400AD, PT-D400VP, PT-D450, PT-H300, PT-H300LI, PT-2430PC, PT-2700, PT-2710, PT-2730, PT-2730VP, PT-D600, PT-D600VP, PT-H500LI, PT-P700, PT-P750W, PT-200, PT-1000, PT-1100, PT-1100SB, PT-1120, PT-1130, PT-1160, PT-1170S, PT-1180, PT-1190, PT-1200, PT-18R, PT-300, PT-310 and PT-320.